Fancy a drink or two? 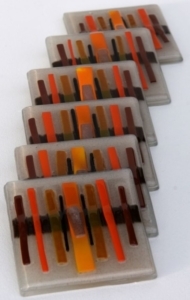 Fused glass art coasters are the perfect accessory for any home. Although they’re much smaller than our usual kitchen splashbacks and glass wall art panels, our coasters are definitely every bit as beautiful. There’s actually a lot that can be done on coasters, and just one look at the variety of designs we’ve created in the past should tell you that the signature beauty of fused glass art is definitely not lost on a smaller scale. The variety isn’t lost, either! Take a look through our portfolio and you’re sure to spot a few coasters, especially if you visit our available stock section. As we write this from a little corner of our showroom, we can spot at least three sets of gorgeous coasters just waiting to find a home. If you’re getting your own made, however, you might want to have a set of matching coasters made to go along with a larger purchase, such as a kitchen splashback or wall panel. That’s a fantastic idea that we’ve seen a lot of customers opt in for, and it definitely can help to create a very strong and identifiable theme in just about any room. Can you imagine welcoming guests into your kitchen, having them admire your brand new splashback and then rolling out a set of matching coasters for them to rest their mugs of tea on? It’s a perfect package! At The House of Ugly Fish, we’re experts when it comes to pieces of fused glass art both large and small. No matter if you’re looking to purchase a simple set of coasters, an accessory to go with a larger piece or something much bigger, there’s sure to be something for you here with us. Make sure you don’t wait to pick up the phone or drop us an email as soon as you can. We’d love to hear from you, and it’d be our pleasure to bring your ideal glass designs to life.